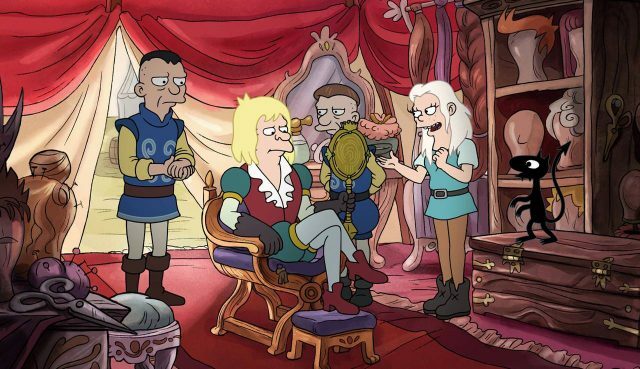 In the previous episode of Netflix’s Disenchantment we met Princess Bean, Elfo the elf, and Luci the demon. We left them falling off the side of a cliff to their certain deaths. 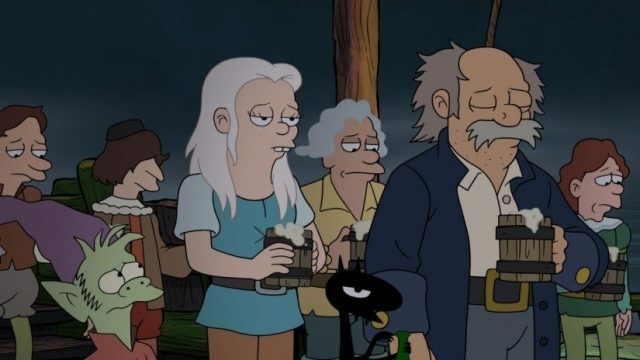 Let’s find out how they got themselves out of that situation in Disenchantment Season 1 episode 2 ‘For Whom The Pig Oinks’. 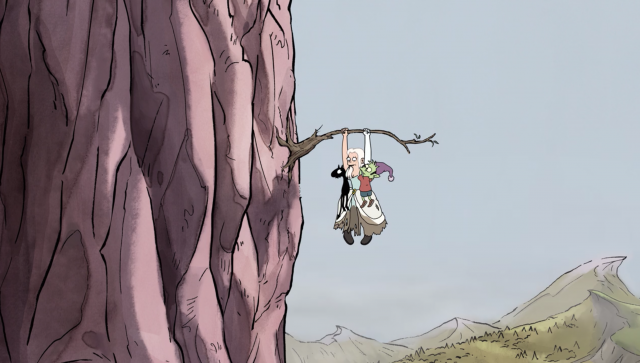 Bean, Elfo, and Luci are revealed to have had caught hold of a stick on the side of the cliff. The stick broke and they resumed their plummet off the cliff. 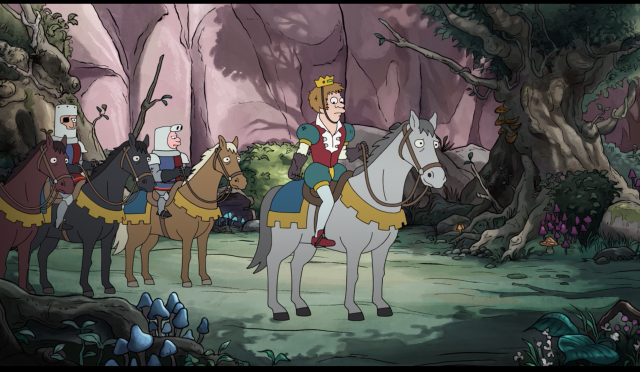 Meanwhile, the group of knights tracking the princess down were inspecting the forest beneath the cliff for the bodies. But to their surprise, Bean landed perfectly on top of Merkimer. This broke her fall and resulted in her capture. The group returned to King Zog, and Elfo was imprisoned in a miniature cage and forced to dance for the king’s amusement. He then tripped and rolled down a massive spiral staircase. Later that night, Zog visited Sorcerio, and learned that elf blood contains great magical properties. King Zog hoped that Elfo’s blood would be able to create the Elixir of Life. Bean tried to think of a way out of her upcoming marriage to Merkimer. Luci attempted to convince her to murder him, but Elfo advised her against it. Importantly, Sorcerio stole Elfo during this conversation. Bean decided against murder. Instead, Bean met with Merkimer and insisted on him having a bachelor party on the open sea. She convinced him to take a party barge sailing towards Mermaid Island. Sorcerio tested some of Elfo’s blood. Unfortunately, it killed the subject instead of healing them. Sorcerio concluded that the problem was the quantity of blood being used. Zog commanded a flask full of blood by the next morning. Bean snuck into the tower and hoisted a pig up from below, and drained it of blood. Zog returned the next morning surprised to find a full flask. Elfo was set free and was able to accompany Bean to Merkimer’s bachelor party. Bean, Elfo, Luci, and Merkimer departed on the boat heading towards Mermaid Island. Merkimer and everyone else aboard the ship was tied to the masts, so that they wouldn’t jump off when they heard the mermaid’s song. But Merkimer’s ropes were rigged so that he would break free of them and jump off the ship to his death. The plan mostly worked, Merkimer broke free of his ropes and jumped off and was “attacked” by walruses. Zog ordered the wedding to start immediately. At the wedding, Merkimer was nowhere to be found. He had made his way to Sorcerio’s chamber, so he could drink Elfo’s blood to re-cooperate the energy he used with the walruses. He mistakenly drank the pig blood mixture. Merkimer was turned into a pig. Bean gave one more impassioned plea to cancel her wedding. And after Zog gave it some thought, he agreed with her. This led to a king fight between Zog and Merkimer’s father as the wedding guests urged them on. 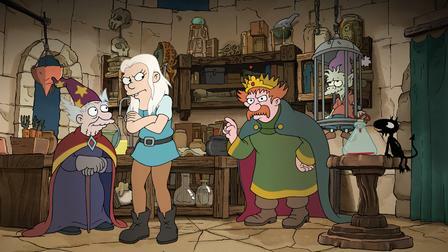 What did you think about Disenchantment season 1 episode 2? Let us know down in the comment section! The post Disenchantment Season 1 Episode 2 Recap appeared first on ComingSoon.net.